Bluconnection – an innovative indigo dye manufacturing company from Singapore has compiled a comprehensive compendium about the history , chemistry and application of Indigo dyes. We are producing some extracts from this compendium . Also show is the complete presentation in a slideshow under the article and it can also be obtained in PDF form Free by email from Paul Cowell of Bluconnection. synthesized, it was extracted from these plants – in the beginning probably just by chewing them. historically, indigo maintained it’s place since it was the only blue dye available and still today, after more than 150 years of organic chemistry and quite a few competitive dyes of blue colour, it is still the most efficient blue dye or pigment. in fact there is no other substance that creates such intensive blue colour with such few carbon atoms in its molecule. important dye for black, blue and brown shades was gained from a plant called “dyer’s woad” (isatis tinctoria). woad was grown in England and Germany and the areas and towns involved in growing and trading woad became extremely wealthy. many rules and regulations gave privileges to those communities in order to maximize and maintain their earnings from woad. share. in Nurenberg it was written that even the death penalty was imposed on those found guilty of having used indigo. nevertheless, woad had nearly disappeared by the second half of the 19th century. by that time the global annual consumption of natural indigo had reached 5,000 metric tons. families involved in overseas trading. due to this, the pioneers of organic chemistry were challenged to find a way to synthesize indigo. In 1883 Adolf von Baeyer, a German professor and winner of the 1905 nobel prize in chemistry, discovered the chemical structure of indigo. based on this work, synthetic indigo production was developed at Badische Anilin & Soda Fabric (BASF) and started in an industrial scale. within only a few years synthetic indigo almost completely replaced the natural indigo imported from overseas. properties. having understood chemically the principle way of applying indigo, reduction to a dye and oxidation to a pigment on the fiber, a number of other vat dyes were synthesized. however, indigo never has been defeated and after decades as a niche product it came back as the dye for denim in the late 50’s of the last century. Production of synthetic indigo had it’s revival during the second half of the last century and indigo has become the most important textile dye. Jeans fashion has reflected the change towards a more liberal attitude. Work wear. originally gold seekers, later cowboys, craftsmen etc. In the 50s BASF was prepared quite well for this hype. Nevertheless BASF’s indigo capacity could not meet the huge global indigo demand during the 60s and 70s. The increasing prices encouraged quite a few competitors to invest in indigo production, particularly in China. it is said that in Hong Kong an indigo drum could be sold for a lot of money. Former sales managers tell about customers who issued blank cheques hoping to get hold of some extra kilograms of indigo.Huge indigo production capacities had been built up in China by the middle of the 90s. with a total capacity around 100,000 tons for a global indigo market of ~30,000 tons. Today we estimate a global indigo market consumption of ~60,000 tons. 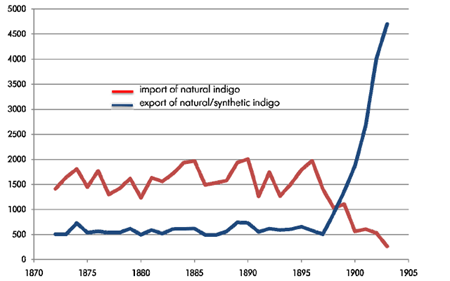 Due to excess capacity for synthetic indigo this market became an oligopoly during the 1990s. lower and lower prices made the smaller producers disappear. it supplies favored shades from black to navy to sky blue. these shades are balanced – not too brilliant or artificial and not too dull. as a pigment it would not participate in metabolism making it very safe for human contact, in fact indigo is used as food dye and as medical indicator applied intravenously. it is “designed” to exist as reduced soluble form during dyeing and as oxidized form as blue pigment. it’s soluble form is not sensitive to water hardness and this allows the dyeing of greige or minimum pretreated cotton.